Shane Walsh is Rick Grimes’ partner on duty and best friend since high school. Shane is a very complex character who has many strengths. Unfortunately his mental instability, obsessive tendencies and unadulterated jealousy eventually transform him from Rick’s number two in command, into Rick’s mortal enemy. ​If you have ever caught yourself admiring Shane Walsh’s clothing, then you have a sharp eye for fashion. Shane has a dynamic style that would be relatively simple to imitate. ​Whether you want to put together a Sheriff Shane Walsh uniform or civilian Shane Walsh outfit, find out how below! 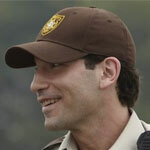 On AMC’s The Walking Dead, Shane Walsh is known to wear two different hats. Shane’s first hat is a brown King County Sheriff’s dept. baseball cap. It appears in season one when he is seen wearing it while on duty. ​The second hat he is known for is his navy blue baseball cap that simply reads “police”. This hat makes it’s appearance in season two. ​Do They Sell Shane's Hat? As a matter of fact they do. This replica hat is a perfect match to Shane’s King County Sheriff baseball cap. ​This navy colored police hat is great match to the one Shane wears in season two. Shane’s jacket is probably my least favorite item from all those worn by Shane. It’s not a bad jacket, it’s just not my personal style. On the other hand however, it is also a very important article for a good Shane Walsh costume or outfit because he’s wearing it when he becomes “walker-Shane”. ​Anyhow it looks to be a navy blue colored bomber style jacket with a fur or fleece lining. Where Can I Buy Shane's Jacket? Unfortunately, nobody seems to know what jacket it is exactly, or where to get one for that matter. Don’t worry though, I managed to track down what I believe is the closest match out there. ​This Izod jacket is nearly an exact match to the jacket worn by Shane Walsh. To build a custom Shane sheriff shirt you will need a tan and brown policeman’s uniform shirt, like this one on Amazon that’s nearly an exact match to Shane’s. Where can I get these shirt accessories? If you’re looking to put together your own custom Shane Walsh outfit, then Amazon just might be your one-stop-shop as it has many, if not all of the items you will need for that authentic Shane Walsh cosplay. King County Sheriff Badge and patches - This bundle that comes on Amazon saves time and money. It comes with one King County Sheriff badge and two shoulder patches. Shane Walsh name badge - Shane’s Gold name badge simply reads “Walsh” you can order a custom badge here. A pair of Eagle collar pins like these (one for each collar) will finish off your Shane Walsh Sheriff shirt. Shane wears a basic black t-shirt under his uniform. Later in the series, he is known to wear a plain t-shirt by itself a lot as well. His favorite shades seem to be white, black, brown, olive and ash. ​His t-shirts are all relatively easy to acquire because they are mostly plain, solid colored tees. Shane’s shirts are nearly identical to these Russell Athletic t-shirts. ​Shane has a very diverse wardrobe for living in a post-apocalyptic hell. ​While on the more modest side, his tactical shirt selection is still surprisingly varied. Shane has been noted to wear a darker blue tactical shirt with stripes, a plain darker blue, and a plain lighter blue tactical shirt. ​Part of what makes his wardrobe so diverse is the amount of layers he stacks on, and one of those cozy layers is made up of his button down, long sleeve, tactical style shirts. The closest match for Shane’s shirts that I have been able to track down are these lightweight tactical shirts, available in a variety of colors. Shane’s favored style of lower torso clothing is tactical style cargo pants. He is known to wear them in a variety of different colors including: khaki, blue, black, charcoal, brown and olive. In this particular case that really depends upon how much you are willing to pay and how much time you are willing to dedicate to searching for the specific pants Shane was known to wear. ​These Levis tank cargos are what Jon Bernthal wore while portraying the character of Shane Walsh. For a screen accurate representation, nothing comes closer. ​These pants on Amazon are the next best thing if you’re unable to track down those elusive Levis. Shane’s footwear is as black and shiny as his hair. He wears eight inch military style black leather boots. His boots are good for waffle making or kicking through the shins of the undead. ​Whether pummeling fellow group members to take out your own frustrations, or participating in sexual escapades with your best friend’s wife (and possibly getting her pregnant), you’re going to need a reliable set of kicks to protect your toes. The navy blue police hat used on screen looks more like a tactical operators hat with hook and loop on the crown. so the patch with “police” on it is raised slightly off the hat. And you can see it’s not directly embossed on the hat itself. This is very common for law enforcement, security forces, and of course the military.